Pershing Square gets a bad rap. Sure, maybe it&apos;s not the most aesthetically pleasing public park around—I mean, brutalism isn&apos;t usually a good choice for parks—but it is one of the few places in Los Angeles where, with regularity, you can expect an outdoor skating rink to materialize for the winter months. 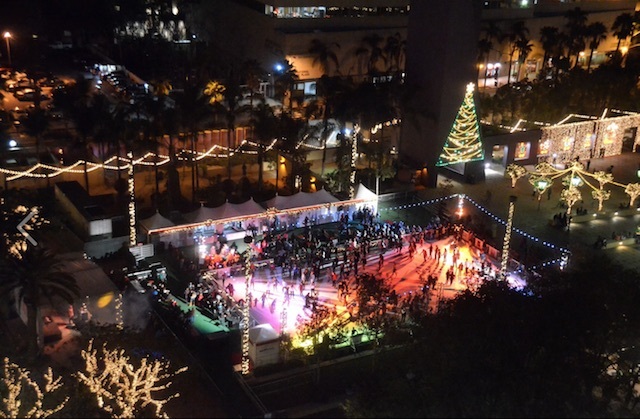 This year, the Pershing Square Holiday Ice Rink will open to the public on November 10. It will remain open to the public 7 days a week, holidays included, until January 16, 2017. Opening hours vary throughout the season, and you can see exact hours on the ice rink&apos;s website. Generally speaking, the ice rink opens to the public between 10 and 11 a.m. each day, and shuts down at 9:30 p.m. On Friday and Saturday nights, skaters glide around the rink until 11 p.m. Admission to the Pershing Square skating rink will run $9 per person. You&apos;re welcome to bring your own ice skates if you&apos;ve got them, but you can also rent some skates when you arrive for $4 per pair. Lockers are also available to stash bags and shoes for $3 each. Tickets can be purchased in advance online or on the same day at the rink itself. Sales for same-day tickets begin approximately 15 minutes before the rink officially opens, though be wary that they can sell out. Online tickets can be purchased in advance at a Pershing Square Skating Rink Eventbrite webpage. Aside from just skating, the ice rink will be the nexus of several public, ice related events and classes. Each Thursday night from 7:00 p.m. until 9:30 p.m. a DJ will be on staff to set the appropriate mood. If you&apos;re interested in learning to curl like the Olympians, you can do that on three select Sunday mornings in November and December. On New Year&apos;s Day, come to the skating rink wearing beach apparel. Parking is usually plentiful at the Pershing Square parking garage, but there&apos;s also a Metro station located at park as well. Make a day trip out of it.